Do you need physical buttons and a special controller case to play games on your iPhone? Probably not – especially if you’re more of a Flappy Bird kind of gamer. 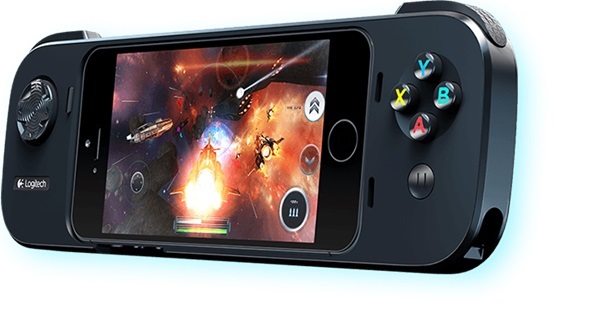 And yet, iOS MFi-certiﬁed game controllers are here, promising handheld console-like gaming for supported iPhone games. of mobile gaming with powerful console-style controls. 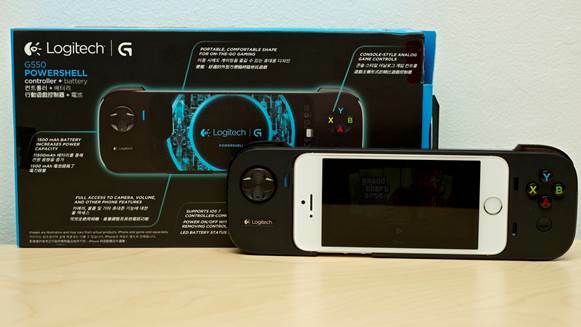 Logitech’s G550 Powershell controller is one of the ﬁrst to hit the market. The case connects via Lightning connector and is compatible with iPhone 5/5s (but not 5c). It meets Apple’s ‘standard’ game controller speciﬁcations, with a SNES-style conﬁguration, adding a D-pad, four face buttons, two shoulder buttons, and a dedicated pause button. As the name suggests, it also includes a built-in battery pack. Sound good so far? Unfortunately, it also costs $129. For that price, you’d expect it to meet Apple’s ‘extended’ game controller speciﬁcations, which requires dual analog sticks and dual trigger shoulder buttons as well...which it doesn’t. of iOS 7 and PowerShell's analog console-style controls. Nevertheless, as expected from Logitech, build quality on the G550 is excellent. The case has a nice solid feel, and a grippy textured rear ﬁnish. Every button is also analog and pressure-sensitive. The four face buttons are ﬁrm, with plenty of travel and a satisfying bottomed out actuation point. However, they are rather small and squished together, which can be a bit ﬁddly, especially if you have a large thumb. The D-pad is usable, but a little erratic to use, and control sometimes isn’t as precise as it should be – for example, in Nucleus, the spaceship would often jerk from side-to-side rather than rotate smoothly. The biggest drawback to the G550’s control scheme is its lack of even one analog stick. While the single D-Pad is ﬁ ne for most games, some, like Grand Theft Auto, use two directional controls, which means that one of these must be handled by the on-screen D-pad – obviously not the best solution. As a case itself, the G550 also feels a bit cumbersome. While your iPhone will sit snugly in the middle of the case, the case itself is also laughably long – it’s unlikely to ﬁ t into even the baggiest of pants pockets. It also makes basic phone functions somewhat awkward to use. For example, the power button can only be activated via a little pull up tab switch that’s just a bit too short, and requires you to dig your nail in underneath it to operate – even then, sometimes it takes a few tries. Meanwhile, headphone access is provided via an unwieldy blue plug that juts out of the bottom of the case. Even just as a backup battery pack, the G550 isn’t the easiest to use. A ﬂashing blue LED indicator on the back shows when the 1,500mAh battery is fully charged, but there’s no easy way to tell how much battery life is left when in use. iPhone 5, iPhone 5s or 5th generation iPod touch. The big problem facing the G550 (and other Apple game controllers), at least right now, is a lack of game support. While Logitech lists ‘hundreds’ of games, I only found a few I wanted to play. And games that could have used a controller, like Street Fighter IV, are not supported, and it looks like there are currently no plans to add support for it. All things considered, the G550 is a tough sell. Even if you can get past the limited title support, its high price, awkward case design, and lack of analog sticks and trigger buttons will still leave you looking for better choices out there.